I'm only a few hundred yards from a very popular farm shop. Beckett's of Wythall is well known among the Brummies and many from my part of Worcestershire, as a place to go for local fruit and vegetables, meat, cheese and fresh bread. In fact, they sell almost everything these days, even if the origin of some of their prepacked food is far from the Midlands. 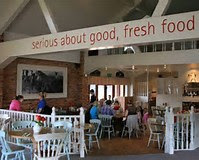 You can even eat a three course meal in their thriving restaurant (below), originally renowned for breakfasts serving fresh eggs from the Beckett Farm empire that has grown up in the area. Mr Beckett now owns most of the farms locally and isn't afraid to advertise it through the sale of his home reared produce. According to the food press, it's not just Beckett's that is doing a roaring trade, farm shops nationally are booming, aid growing demand from middle-class shoppers and trendy 'hipsters'. Maybe they were once seen as a quaint 'old-folk' place for the tweed set or farming community, selling odd cuts of meat and homemade jam. And they were expensive too - though some would say they still are! However, their customers have grown in recent years from 1,200 shops in 2004 to around 3,500 today. A poll of 2,00 shoppers found that four in ten people have been to a farm shop in the past 12 months and nearly 50% intend to visit one in the future. Admittedly, such a small poll is not proof enough of the increase in farm shop customers, but if my local Beckett's is any indication, then farm shops are booming. Three in four folk interviewed in the census said that they went to a farm shop for the quality of produce and 60% cited the provenance of the goods. Well, you can be sure that most of the vegetables and meat and much of the fruit has not be transported halfway around the world and sat in freezers for days. It seems that middle class shoppers with discerning tastes have helped fuel the enthusiasm for artisan produces and organic food that can be traced to a local source. 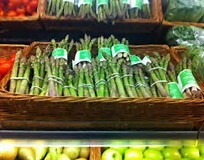 Witness the growth in organic food markets in our local towns. Even the suburbs of Birmingham have monthly artisan food markets in trendy places like Moseley and Kings Heath. This trend has helped to make farm shops the fastest-growing part of the meat-selling industry, according to the Guild of Butchers. 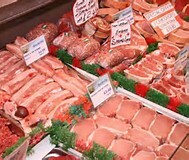 In a piece of regional research, for example, 48% of consumers in the South East and South West of the UK visited a farm shop in the past year to stock up on fresh meat. This was compared to 26% in the North East. Let's hope this boom in farm shopping continues and the big high street supermarkets don't try to emulate the 'farm shop' by building out of town 'farm stores'. Don't bet against it though!